Surelog Homes are designed and created to offer you the finest in log home living. This means your home is constructed with the best logs available and is designed according to your personal wishes and the highest architectural standards. 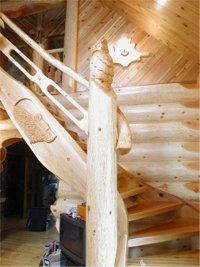 Before shipping, your home will first be cut to exacting standards and then pre-assembled so that upon arrival each log fits exactly into place. Here in British Columbia we are fortunate enough to have some of the finest timber in the world. 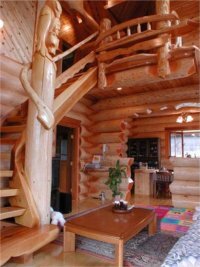 The most common species used for log homes are cedar, pine, spruce and Douglas fir. Many of our clients choose Douglas fir based on its appearance, strength, and availability. These logs tend to have a consistent taper, have a lovely salmon-coloured heartwood and make for a very beautiful log home. Regardless of the species you prefer, each log is inspected carefully for strength and beauty. Each log in your new home will be a natural masterpiece in itself. For lasting strength and durability, your home will be built using a shrink fit notch and an over scribe lateral groove. Through repeated tests, comparisons and our lengthy experience we have established this historical Norwegian technique to be superior and provide the highest quality product. For handcrafted grace, distinctly shaped log ends are formed into sculpted archways. Customized carvings can be added at your discretion. Subtle artistic touches such as these will give your new home a charm that is uniquely yours to enjoy. Company president, Terry Hall, started Surelog Homes Ltd. in 1989. The company was created in an effort to offer his clients a combination of skilled construction techniques while leaving room for personal expression. He felt certain that his clients would appreciate his high standards and passion for excellence. Time has proven him right. To achieve the goal of superior home construction, Surelog Homes has brought together a team of craftsman and artists, some of the best builders in Western Canada. To see their work is to understand the degree and level of their skills and artistry and to realize their dedication to their craft. Surelog Homes Ltd. offers a wide variety of options as you choose the structure best suited to your needs. From small intimate structures to large residential and commercial projects with complex roof structures, Surelog Homes Ltd. has the experience and expertise to help you create your dream. Your new home arrives in a log package 'carpenter ready' due to the many details provided by Surelog in order to simplify the carpenter's jobs. Surelog has sent homes to satisfied customers throughout the world. Overseas packages are loaded into open-top containers and shipped out of Vancouver or Seattle to the clients' ports of choice; on the continent, log packages are loaded onto trucks and tarped to protect the logs being delivered to their final destination. All our homes are F.O.T (freight on truck) in our yard, meaning all shipping and crane times to reassemble are an extra cost to the buyer. For pricing please contact Surelog at 250-675-2318.